CIA Director John Brennan has a lot to worry about. One of his biggest concerns during the past year has been trying to avoid the fate of Kodak and Blockbuster — two industry giants that failed to recognize how technology changed the fundamental nature of their businesses and lost their market prominence. For the CIA, however, the stakes are much higher. If the agency fails to adapt to emerging technologies, it runs the risk of being unable to prevent major regional upheavals, the nation’s military adversaries may be able to operate with impunity and it will be more difficult for American spies to remain hidden in dangerous places. It is for all of these reasons that Brennan has embarked upon the largest reorganization of the CIA in its 68-year history. Announced in March, the restructuring took its first formal step April 30 with the naming of 10 new assistant directors to lead six new regional mission centers and four functional mission centers. Each center will be staffed by a mix of the CIA specialists — analysts, clandestine service operators, science and technology specialists, and support staff. But for the first time in 50 years, the agency has created a new directorate. The Digital Innovation Directorate will form a central component of the new mission center organizational concept. This new fifth directorate will be responsible for integrating the emerging digital environment, from social media to big data analytics and cybersecurity, into each intelligence tasking. Almost as soon as Brennan started circulating the idea of an organizational change, many career CIA officers began asking him what part of the agency he thought was broken and needed to be fixed. That’s when he appointed nine senior agency officials to carry out a 90-day study, including a survey of thousands of employees covering all aspects of CIA organization and operations. The resulting recommendations fell into four major lines of effort, including workforce development, business practice reform, restructuring into focused mission centers and establishing a new directorate for digital innovation. Central to all of the reorganization efforts currently underway is a new workforce development program to provide a range of experiences for CIA employees so they are exposed to new opportunities and develop a better understanding of the many facets of the intelligence profession. 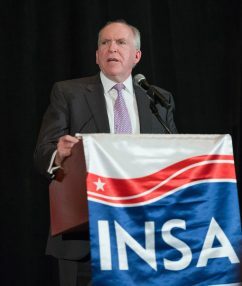 And the newer recruits coming into the agency — part of the so-called millennial generation — are having a major influence on the changes taking place throughout the CIA, according to Brennan. That digital dust also has an impact on the earliest stages of CIA recruitment. Even new employees arrive with digital dust trails of varying sizes, Brennan acknowledged, presenting new challenges to developing, training and retaining clandestine case officers. Open source intelligence at the CIA has its roots in the Foreign Broadcast Information Service, known as FBIS, which collected and translated massive volumes of open news information from around the world for use by analysts throughout the U.S. government. In 2005, FBIS became what the CIA now calls its Open Source Center. But there are significant challenges. The amount of open source data available through public media and social sharing sites is astronomical and growing by the hour. One of the major concerns for the CIA is the ease with which information can be obtained that supports a particular thesis. “We have to understand what is the reliability, the integrity of the data. This is going to be a long effort,” Brennan acknowledged. But it is an absolute necessity, he said. For example, phenomena like the Arab Spring — a regional transformation set off by the self-immolation of a Tunisian fruit vendor — spread across the region like a wildfire and was largely missed by the CIA. For the CIA, taking a 21st century approach to intelligence collection is an exercise in radical culture change. But it is a necessary evolution that, in large part, is being driven by the spread of technology around the world. “We need to be applying the analytic skills, the operational savvy, as well as the digital expertise. Because even in places like Yemen and Syria and Iraq, you see people who are on their phones. They’re using all sorts of mobile devices,” Brennan said.